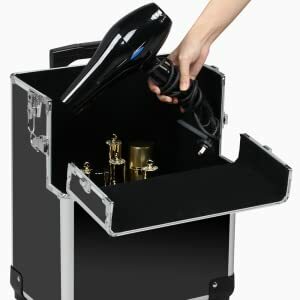 LARGE STORAGE SPACE: 36L x 24W x 70H cm/ 14.2L x 9.4W x 27.6Hââ Large makeup train case with high load capacity up to 30 kg/ 66 lb is a perfect storage for a large number of hair tools, cosmetics and nail tools. 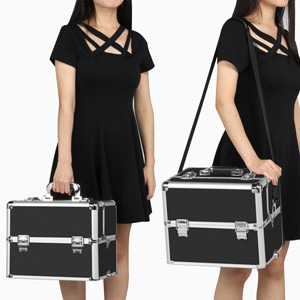 36L x 24W x 28H cm/ 14.2L x 9.4W x 11Hââ upper portion can be used solely as a smaller portable makeup case. A strap is included for easy carrying. 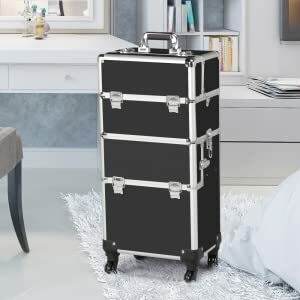 14.2L x 9.4W x 27.6H’’ Large makeup train case with high load capacity up to 66 lb is a perfect storage for a large number of hair tools, cosmetics and nail tools. Retractable trays and separated middle tray are handy for display and daily use. It is a fantastic piece for families, hair salons, beauty shops and nail salons. The metal and plastic protected corners and aluminum reinforced rounded edges are for added durability and sturdiness. The upper portion can be used solely as a smaller portable makeup case. A strap is included for easy carrying. 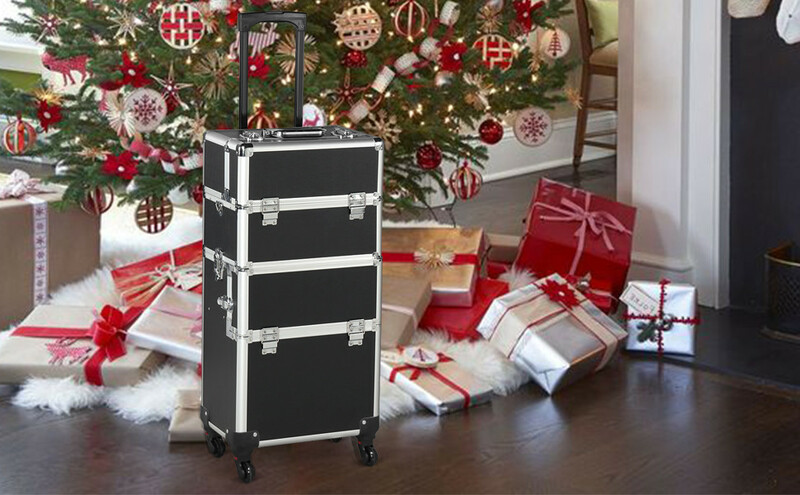 This makeup case sits on four high quality wheels for quiet and effortless rolling. 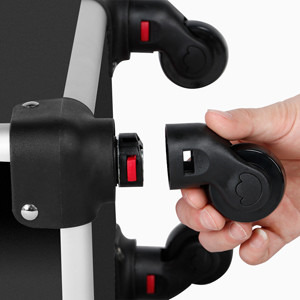 Detachable wheels can be easily removed or replaced if needed. 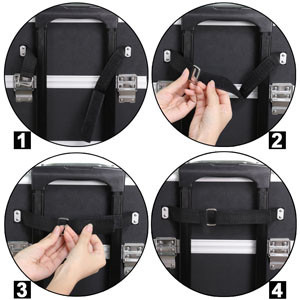 Removable pull handle can be fastened to the makeup train case with a sticky magic tape. Fully extended height of the pull handle can up to 41.9’’, suitable and comfy height to use. This trolley makeup case sits on four smooth rolling wheels and can be pulled with a sturdy pull handle, which is convenient to carry around. No dividers in the large compartments, so it is able to hold hair dryer, hair straighteners, sprays, brush bags and other items that are in relatively big size. Velvet lining protects the items from damaged during the trip. It is suitable for make-up artists of the crews, weddings and celebrations. 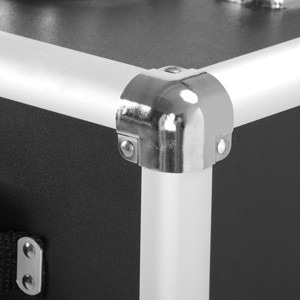 Heavy duty metal clamps with smooth and glossy surface can tightly secure the case during. 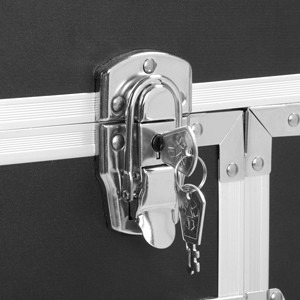 Four lockable clamps on the top and sides to guard your items, four keys are included. Every corner of this makeup train case is well protected with metal and plastic for added durability and sturdiness. Aluminum reinforced rounded edges share the same function as corners. 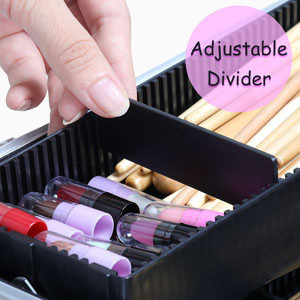 There are several dividers that can be placed in the retractable trays and middle removable storage, which help you arrange your cosmetics in a more organized and neat way.